A view of Champion Cemetery from the Brushy Creek Regional Trail. 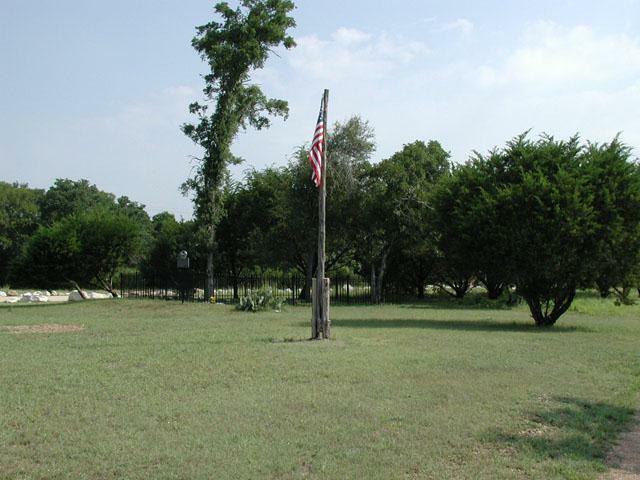 Champion Ranch is a very small plot located adjacent to the Brushy Creek Regional Trail. In keeping with the well maintained park space the cemetery itself is also well cared for. It is surrounded by a small wrought iron fence and includes am historical marker and an American flag. 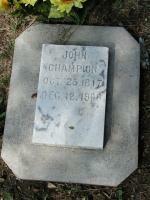 The cemetery is named for the family of John "Jack" Champion. Originally from South Carolina he settled into Texas in 1850 and married Naomi Standefer, with whom he had seven children. In 1854 he bought 200 acres along Brushy Creek. He served both in the civil war and was county sheriff for a short time. The headstones are obviously not the originals. The slabs are largely pristine, of consistent quality and sit on concrete bases. 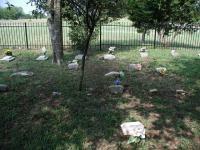 In addition to the markers that have been replaced, there is evidence of several unmarked graves as well. It's often sad to see old family cemeteries that get engulfed in the sprawl that explodes around them. However, this little cemetery seems to have found itself in as attractive location as possible in this quickly growing area.